PARIS ? The 27-nation European Unionand individual Europeannations that are not taking part in the International Space Stationwill beable to place experiments on the orbital complex for a three-year trialperiodthat ultimately could provide a fresh revenue source for the project,EuropeanSpace Agency (ESA) officials said Oct. 21. The new policy, disclosed by ESADirector-GeneralJean-Jacques Dordain during a meeting in Brussels, Belgium, of Europeanministers to discuss space exploration policy, has been approved by theESAgovernments now financing Europe?s space station program and by NASAand theother station partners, Dordain said. Only 10 of ESA?s 18 member statescurrently contributeto the project, led by Germany, with about 38 percent ofEurope?s share;followed by France, with 27.6 percent; and Italy, with 18.9 percent. Dordain said opening the station tononparticipating ESA andEuropean Union nations would be permitted through 2013 and was ?goodnews? 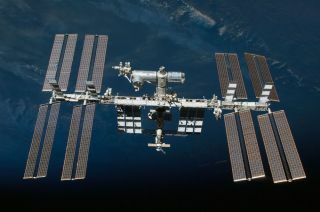 asEurope seeks to reposition the space station as a springboard andtestingground for future space exploration efforts. Several nations taking part in the"SecondInternational Conference on Space Exploration" voiced support forextending the station?s life at least until 2020, a NASA proposal thatotherstation partners ? Canada, Russia and Japan ? have accepted but Europeis stillweighing. The problem in Europe is financing.Germany has committed topaying its 38 percent share of Europe?sstation operating costs between 2011 and 2020, an investmentthat Germanyestimates will total about 3.8 billion euros ($5.3 billion). France has not yet committed to the10-year financialeffort. Unlike many of her colleagues making statements at theexplorationconference Oct. 21, French Research Minister Valerie Pecresse made nomentionof the space station as a future exploration platform, and avoided anyreference to the topic of extending the station?s operational life. Simonetta di Pippo, ESA?s director ofhuman spaceflight,said the agency still expects to win its member states' formal supportfor thestation extension in December. In an Oct. 21 interview, di Pippo saidthe exactcost of the 10-year effort will depend on which options ESA membersagree toadopt. Among other possibilities, she said,ESA could elect to payNASA in cash for Europe?s use of the station?s common resources, or itcoulddevelop further unmannedcargo carriers to offset the cash obligation. Di Pippo said the EuropeanCommission, which is theexecutive arm of the European Union, has recently taken a seat atmeetings ofESA?s space station program board. In addition, the commission hasagreed topermit its research funds to be used for space station experiments. In 2014, the commission?s nextseven-year financial packageis scheduled to be approved. It is in this document that a more formalrelationship in station participation should be detailed, includingwhatfinancial resources from the commission might be added to ESA?s tofinanceEurope?s station use, di Pippo said. "I see a lot of very goodintentions," di Pipposaid. "This three-year pilot phase is there to show how this processmightwork, how it could be put together." Several nations attending the Oct. 21conference said theysupported the international space station but that its operating costsneededto be reduced. Some of these nations also said bluntly that new stationuserssooner or later should be prepared to pay their way out ofconsideration forthe investment made in building the orbital complex. Di Pippo said reducing cost is one ofthe elements of theproposal ESA will make to its member states in December as it seeksendorsementof the extension of station operations to 2020. ESA is also discussing with NASAalternatives for a commontransport policy for the station after the U.S.space shuttle is retired in 2011. The conclusion of these talks, whichdi Pippo said wouldcontinue in Cape Canaveral, Fla., the week of Oct. 25, will help ESAdeterminewhether it should develop an enhanced version of its AutomatedTransfer Vehicle cargo freighter. The proposals involveenhancing thevehicle?s cargo-carrying capacity and making it capable of returningexperiments to Earth instead of being burned up on re-entryinto theEarth?s atmosphere. Thisarticle was provided by SpaceNews, dedicated to covering allaspects of the space industry.